Some chefs will tell you that cooking is an art while baking is a science. They mean that in an almost disparaging sense. However, anyone who has ever sampled a lemon meringue roulade, an Apple Charlotte or a Tarte Bourguignonne prepared by Eric Lanlard will argue that these are not just successful experiments, they are culinary masterpieces! 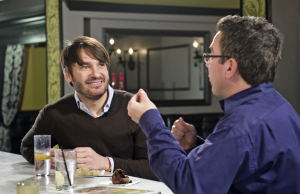 Master Patissier and two-time honoree as the Continental Patissier of the Year at the British Baking Awards, Eric Lanlard, owns and operates Cake Boy in London and is the host of beloved British tv series: Baking Mad and Glamour Puds. He is also the author of the eponymous baking mini-bible, Cake Boy . Today, Eric visits The High Bar to serve me my just desserts(?) and to raise a toast to and raise the bar for… baking. * Want the perfect recipe for a career eating professionally? Drop in on my conversation with Top Chef’s Gail Simmons at The High Bar. * Or, for more about The Art and Soul of Baking , eavesdrop on my conversation with the sweet and sharp, Cindy Mushet on The Warren Report.